Last month Smithsonian Folkways released a CD collection called The New Lost City Ramblers – 50 Years: Where Do You Come From? Where Do You Go? This release is a must-have 3-disc box set from a musical trio whose reverence for and dedication to, the geniuses of the American folk music tradition, put them at the forefront of the folk revival of the late 1950s. 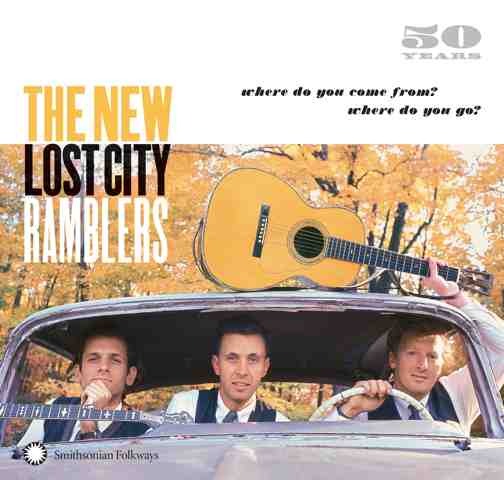 The New Lost City Ramblers was, in its day, a contemporary old-time string band from New York City. They took their inspiration from the old time or Appalachian, musicÂ that was the focus of the band’s research. The band came to prominence during the Folk era that started in the late 1950’s, and recorded nine albums in its first four years together. Some say that the New Lost City Ramblers brought old-time string band music to the folk revival before it could rightfully be called a revival. The founding members of the Ramblers were Mike Seeger, John Cohen, and Tom Paley. Tom Paley later left the group and was replaced by Tracy Schwarz. The band toured whenever they could and recorded prolifically for the Folkways label. Mike Seeger, whose life was devoted to the documentation, teaching and sustaining the sounds of traditional music of the American South died from cancer on 7th August 2009 at the age of 75. Although the focus of their music was directed more towards old time music, the New Lost City Ramblers are compared to other significant folk groups of the time such as The Weavers and The Kingston Trio. They were also be compared to the artists whose work they tried to emulate such as the legendary Carter Family. I listened to The New Lost City Ramblers. Everything about them appealed to me, their style, their singing, their sound. I liked the way they looked, the way they dressed and especially I liked their name – Bob Dylan from Chronicles. This three CD set reveals the relevance of old time music to much of today’s bluegrass music. To hear the old time sounds from tracks such as Long Journey Home, Don’t Let Your Deal Go Down, Foggy Mountain Top and White House Blues, brings a stark reminder of where the music came from that continues to inspire today’s modern bluegrass sound. Smithsonian Folkways’ release of this NLCR collection features 81 tracks, including 6 previously unreleased songs on 3 CD’s, and delivers over 3½ hours of music along with an 88-page booklet. It is a fair chunk of musical history that is well worth having. Australian Bluegrass Blog readers can purchase the collection and download sample tracks from the Smithsonian website.